Just wanted to wish you all a Happy Thanksgiving (and black Friday shopping if you dare to brave the crowds). The Cornucopia (horn of plenty) is a symbol of abundance and nourishment and is associated with Thanksgiving in America. 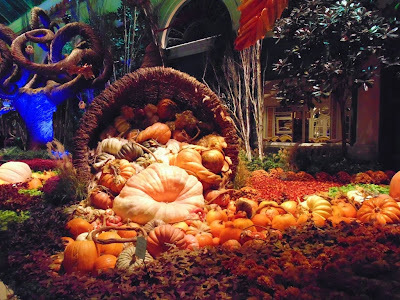 Here is the giant cornucopia on display at the Bellagio Conservatory in Las Vegas. The Cornucopia is tied to several Greek and Roman deities, particularly those associated with harvest, prosperity and abundance. I give thanks to my family, friend and the many of you that read this blog and follow @Hawaiiblog on Twitter or Instagram. May your holiday season be filled with an overflowing Cornucopia of happiness and joy. Allow me to take a vacation from Hawaii photos for some Thanksgiving themed pictures from Las Vegas (many people consider this the 8th island of Hawaii). Here is part of the ever popular Bellagio Conservatory and Botanical Gardens display. If you are ever in Vegas be sure to stop by as the Conservatory always has a great display and is FREE and open 24 hours a day. 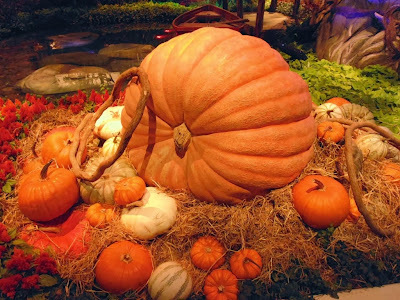 Here is one of the giant pumpkins on display. Just imagine how many pumpkin pies you can make with this. Probably enough to fill a buffet line at one of these casinos. All good things must come to an end and thus we end our Restaurant Week Hawaii 2013 series today. 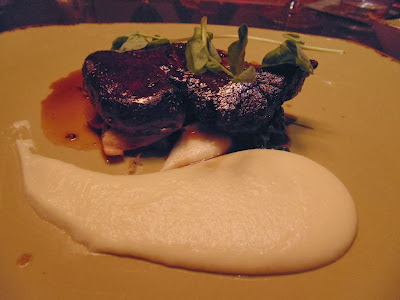 Finishing our meal at Japengos with the Hawaii Ranchers Butter Poached Beef Tenderloin with sake creamed spinach, Hamakua mushrooms and white soy-garlic potatoes. Exquisite and mouthwatering. 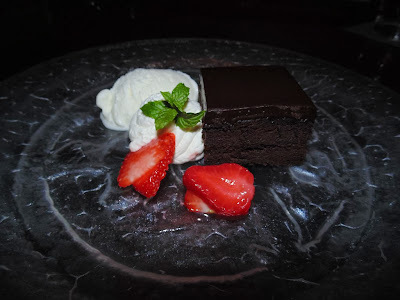 Finally to end our meal and Restaurant Week the Wailua Estate Flourless Chocolate Bar with marscapone and fior di Latte Gelato. I hope you enjoyed this series and that you even got to dine at one of the restaurants. Thank you on behalf of all the precipitating restaurants and the Culinary Institute of the Pacific at Diamond Head who received some of the proceeds from the week and will create the next generation of fine chefs.